Due to anticipated snow and black ice, I am cancelling the Association’s Winter Quarterly meeting in Pontiac, originally scheduled for Sunday, January 20. Due to the fact that two storm fronts are going to pass through the Pontiac area, the Board felt it would be safer to cancel the meeting on Sunday rather than have everyone caught in the possible snow and ice storm. This has been an unusual winter and although we all looked forward to a hot lunch provided by the Log Cabin Restaurant, we feel its better to be safe than sorry. Based on the last storm (last weekend) the area along 66/55 was hit pretty hard with snow, wind, and ice. This weekend on Sunday there will be some polar air coming through as well with strong winds. So be safe, stay home and keep warm. Cuddle, watch Netflix and dream of custard at the Whirl-A-Whip! We will be rescheduling the meeting and will notify everyone as to the new date. One of our association’s most active preservation workers, Mike Cummings has passed away. He died from a blood clot on December 30th. This was as a result of an icy fall he had just after Thanksgiving. He had an operation to repair a broken bone due to the fall. He was recuperating at home. View Mike’s obituary on Kurtz Memorial Chapel’s website. 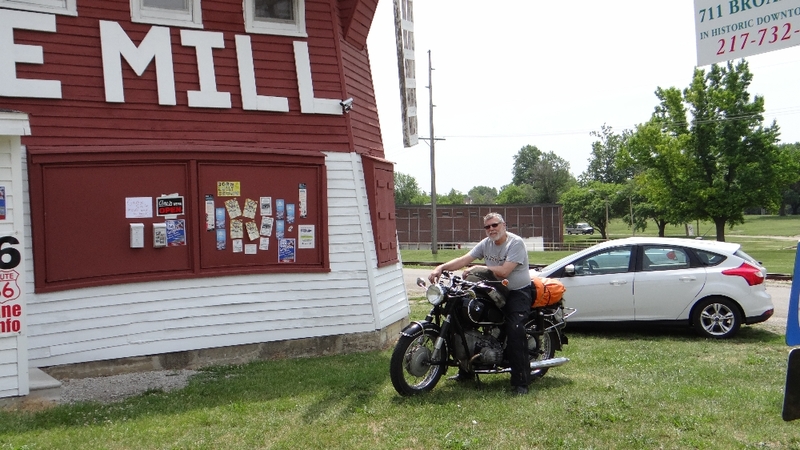 Mike paid for, built and directed the assembly of the motorcycle case at the Odell station. (He also prepared the motorcycle for display). He designed, donated and paid for all the awards for the charity cancer fundraiser car show at Odell. He was part of our painting crew at the Mill in August (see page 26 of the current 66 News). He was part of most preservation projects, large and small for many years. Years ago Marty (Blitstein) met Mike Cummings at Delmar’s Restaurant in Blue Island eating French Toast wearing a 66 t-shirt. Marty went over to talk with him and gave him his card. They ended up having breakfast together and Marty gave him a membership application and a newsletter. They continued to meet and have breakfast as Del Mar’s was “Mike’s” place. Both their jobs changed but through 66 they stayed in touch. Mike would hand deliver his dues to Marty every year. Mike came down to the museum, and went out west to meet Bob Waldmire and spent time on the bus with him. Mike is one of the few people that actually stayed with Bob and lived on his bus. Bob painted the whole interior of Mike’s Mustang engine compartment for him. When Mike was in a horrible car accident out west, the Mustang was totaled. None of Bob’s artwork on the interior of the engine compartment was damaged and the car was shipped back to him. Mike saved it for his Waldmire collection that he started after meeting Bob. Mike was a generous, good natured man who survived a lot of accidents and surgeries. 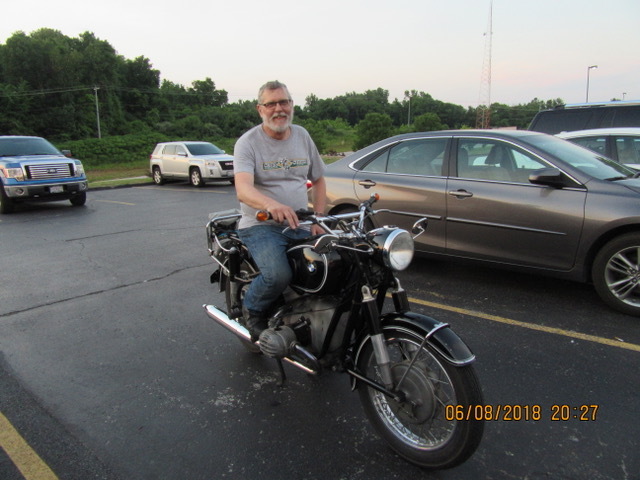 He loved his bikes and would visit at Pontiac and then say “Got to go it’s just a beautiful day to ride.” Mike was an excellent photographer and had a series of photos of sunsets out west on Route 66 that were spectacular that he shared with us a couple of months ago. We have lost an amazing, generous soul. Oh my gosh! This is so sad – condolences to everyone. He just repainted the sails at the Mill with John and John this summer. It’s fall – orange, brown, fading greens. The days are getting shorter, our shade is slowly drifting downward as we enjoy these last days of summer and fall begins. There is still a lot of things to do on Route 66 – festivals, pumpkin patches, conferences, the last outdoor concerts, the last car shows, the last impromptu visit to somewhere for dinner and pie and laughter-punched conversation. It’s been a good year on Route 66 in Illinois. We had another successful Motor Tour, countless car shows, we’ve gotten a little more done on our preservation maintenance, and are seeing a few new historical museums on the horizon that we can help foster. Michael Storm is working to help create and launch a museum in Berwyn on Ogden Avenue appropriately housed in a former car dealership! The amazing Mining Museum in Gillespie that Dave Tucker and others have worked so hard to bring about was a highlight on the Motor Tour. 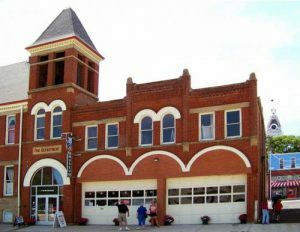 There is a new stop in Gardner near the Two Cell Jail and the Streetcar run by Tom Perkins called “The Shop on Route 66” – stop by and find out the history of Gardner – and more! Holly and Tully have made amazing strides with the Gemini Giant/Launching Pad – and it has gone from a dark, tired building on the side of the road to a brightly lit neon mecca that sparkles and shines. Every week there is progress and its no nice to come around the corner into Wilmington and see the Giant well-loved and protected again. Its time for all of you to think about the people and places that should be honored by being nominated for the Route 66 Hall of Fame. Nominations are taken from September 1 through December 31 for the 2019 Class of the Hall of Fame. Think about the people and places you knew/know, and how they relate to the road, and share their stories with us. 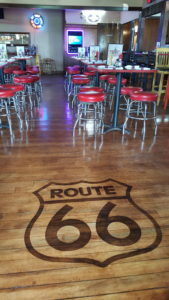 Nominees can be a person, a place, a destination, or an event that occurs/occurred on Route 66 in Illinois. 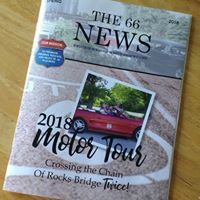 Check our website for the criteria for the nomination and outlines for information are also available at the Route 66 Hall of Fame and Museum in Pontiac. The National Parks 2018 grants are out and Illinois garnered money for the return of the original neon in the windows at the Ariston Cafe, and a rebuild of part of their sign. There was matching funding for much-needed projects regarding our historic Bridges from Chicago to Santa Monica. The Route 66 Gasconade River Bridge in Hazelgreen, Missouri received money to fiund a study on how best to use this structure and fund an engineering report. The Road Ahead has made progress, held meetings, and is working on different Committees to advance all the needs of the road. Our State Associations are very vital to the history, preservation and caretaking of our individual states, but we are working together for the benefit of the entire road. If we can become a National Trail, we will never lose a piece of road to politics or be forced to close alignments because local government can’t afford to maintain the road. Every piece of 66, every alignment, every bypass that’s left intact, needs to be respected. At our Hall of Fame banquet this year, we honored those members who worked hard to start our organization, those people who took it upon themselves to donate time and effort to launch our group and to help fine-tune and help the Association grow. We acknowledged (in random order): Frank and Roxane Lozich, Lou and Bud Van Diver, Adele and Harry Hodges, Getty McLellan, Nancy Saul, Annette Lafollette, Marilyn and Durelle Pritchard. Jeff Meyer, Tom Flasch, John and Lenore Weiss, Chester Henry and Bob Waldmire. Barbara and Bill Gwodz, Dolores and Lenny Scinto, Anne and Larry Scinto, Ted and Marilyn Giovannazi, Duke and Vada Cartwright, George and Sharon Leone, Tom Teague, Bill Shea and Dorothy Seratt McMullen. The President’s Award went to two individuals who quietly have gone about taking care of important parts of preservation with our group and on their own: Dorothy Seratt MceMullen and Tom Perkins. The both lead by example. Elections are in October in Pontiac at the City Hall Annex at 115 W Howard Street – across from the museum. Come join us to talk about where we’ve been, where we need to go, and join and help us be all that we can be. The museum will be moving to winter hours come November 1 (10:00 AM – 4:00 PM) but we’re still open seven days a week. Come home and visit! I wish you a colorful fall and few more weeks before the “Honey Do” list means the car is in the driveway instead of out on the open road. Take time for family and friends and family of choice. Take time to savor the great atmosphere and food at the Wildhare Cafe/Horsefeather’s in Elkhart. Take a selfie at the directional pole/24 hour camera at the Williamsville Public Library parking lot. St Michael’s in Staunton is having their 39th Annual Octoberfest on October 6th and 7th. Pumpkin Festival and VChili Cook-off in Girard on October 13th (no pumpkin chunkin ‘ this year)! Support your Route 66 communities! See you on the road! Just a reminder that the Winter hours of operation for our Hall of Fame and Museum switch to winter hours (10:00 AM – 4:00 PM) beginning November 1. 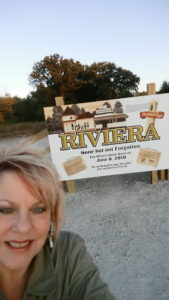 We hope you’ll come visit us at our unique Route 66 attraction honoring the Mother Road in Illinois. We’re located at 110 W Howard St in Pontiac. Our museum is chock-full of memorabilia from Route 66’s heyday. Admission is free. We’re handicapped accessible. We have friendly volunteers ready to inform and delight you with their knowledge of Route 66. So what are you waiting for? 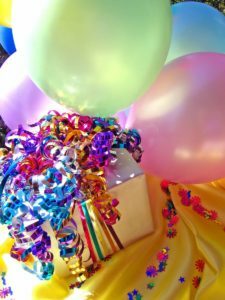 It’s time for our membership chairman, Marty Blitstein’s annual birthday special! In honor of his special day, this year, Marty is offering an extra special incentive to join our Association! Click to read all about it on our Membership page! 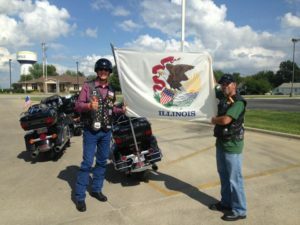 Governor Rauner is planning a motorcycle ride down Route 66 on Sunday August 26! He plans is to stop at the Route 66 Association of Illinois Hall of Fame and Museum in Pontiac, Illinois around 10:00 A.M.